Dairymaster, a world leader in dairy equipment manufacturing, has come on board as sponsor of two student awards for the final year of the BSc (Hons) in Agricultural Science degree. The awards, which will be presented to the students with the best final year project presentation, will be judged by a panel of experts from Dairymaster, Teagasc and WIT. 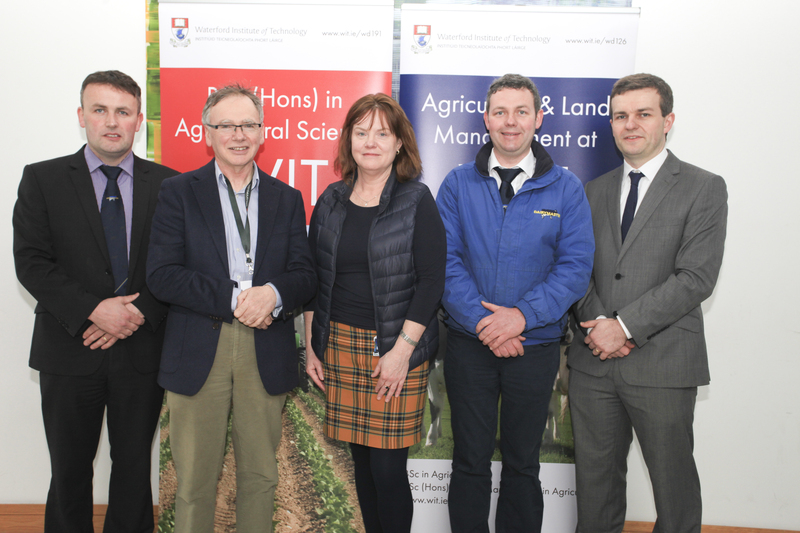 “This is an exciting development for both the students and the agricultural science programme here in WIT. Having a world leader in agriculture like Dairymaster as one of our external stakeholders is extremely exciting and gives our students the opportunity to excel academically and enhance their future career prospects,” said course leader Dr Michael Breen. “The BSc (Hons) in Agricultural Science was again one of our most popular undergraduate science courses amongst CAO applicants,” he said. There are approx. 180 students across all four years of the Ag Science programme, with students travelling from beyond key catchment counties of Waterford, Wexford, Kilkenny and Tipperary from all parts of Ireland to study Agricultural Science at WIT. Dairymaster have won numerous Innovation Awards worldwide including at the three largest agricultural exhibitions in the world for products such as the MooMonitor+, the Swiftflo Revolver Goat Rotary milking parlour and the latest Swiftflo Commander which is like an iPad for cows. Dairymaster’s innovative product range encompasses five key areas: Milking Equipment; Automated Feeding Systems; Manure Scrapers; Cow Health & Fertility Monitors and Milk Cooling Tanks. Technology is a big focus throughout. It has customers in more than 40 countries. “The Dairymaster Ag Science Student Award process will help students realise the relevance of their final year projects to a world beyond college. The bursary is very welcome in helping our students make the transition to the workplace following their studies,” added Dr Breen. The BSc (Hons) in Agricultural Science course is a four-year full-time level 8 course which prepares students for a career in the areas of agricultural science and agri-business. The programme is delivered in conjunction with Teagasc at Kildalton College of Agriculture. Transport is provided to Kildalton. Self-management, team working, business awareness, problem solving, land management and communication are all areas which are strongly incorporated into the main core of this level 8 programme. In the second semester of year 3, students can choose between a farm placement or an industrial placement. The Farm placement is designed to give the student experience of practical farming on a high quality farm. The Industrial Placement will allow learners to apply and develop their skills in the agri-food industry. Graduates have a strong background in the areas of science, food, agriculture, the environment, business and quality assurance. Graduates from this course can expect to find employment in agri-food industries, sales and marketing departments of agri-businesses, consultancy and advisory services.